I am an Assistant Professor at Electrical and Computer Engineering Department, the University of New Mexico. I received my Ph.D. degree in Computer Science with Department of Computer Science at the University of Texas at Dallas. My current research mostly focuses on computer graphics and related topics. More specifically, my research interests include deformable model, physics-based animation/simulation, medical imaging analysis and visualization. My name reads like Yin & Yang in Mandarin if you put my first name first, which is a famous concept in traditional Chinese philosophy and also one of my main inspirations in my research and life. Our lab has multiple RA openings (for Ph.D. students). We also have at least one Postdoc position available and competetive salaries will be provided. Feel free to drop me an email if you are interested. Minmin Lin, Tianjia Shao, Youyi Zheng, Zhong Ren, Yanlin Weng, Yin Yang, "Automatic Single-Image Mechanism Modeling using Deep Neural Network", conditionally accepted by Computer Graphics Forum (PG 2018). Jiamin Xu, Weiwei Xu, Yin Yang, Zhigang Deng, Hujun Bao, "Online Global Non-rigid Registration for 3D Object Reconstruction Using Consumer-level Depth Cameras", conditionally accepted by Computer Graphics Forum (PG 2018). Weiwei Xu, Haifeng Yang, Yin Yang, Yiduo Wang, and Kun Zhou, "Stress-aware Large Scale Shape Editing using Domain-decomposed Multigrid Solver", conditionally accepted by Computer-Aided Geometric Design (GMP 2018). 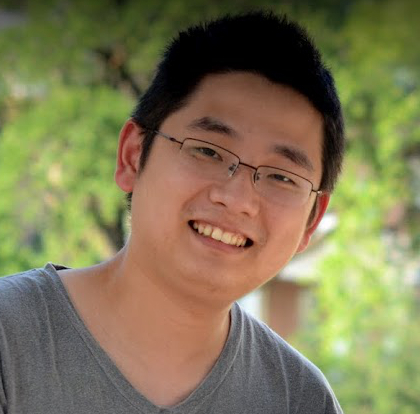 Ran Luo, Weiwei Xu, Huamin Wang,Kun Zhou and Yin Yang, "Physics-based Quadratic Deformation Using Elastic Weighting", to appear in IEEE Transactions on Visualization and Computer Graphics, 2018. Yuming Zhang, Guohui Zhang, Rafael Fierro and Yin Yang, "Force-Driven Traffic Simulation for Future CAV-Enabled Smart Transportation System", to appear in IEEE Transactions on Intelligent Transportation Systems, 2018. Yuming Zhang, Steven Garcia, Weiwe Xu, Tianjia Shao and Yin Yang, "Efficient Voxelization Using Projected Optimal Scanline", to appear in Graphical Models, 2017. Ran Luo, Qiang Fang, Jianguo Wei, Weiwei Xu and Yin Yang, "Acoustic VR of Human Tongue: Real-time Speech-driven Visual Tongue System", in Proceeding of IEEE VR, 2017. Wang Lin, Kunjin He, Zhengming Chen and Yin Yang, "A Design Method for Orthopedic Plates Based on Surface Features", in Journal of Mechanical Design 139, no. 2 (2017): 024502. Huamin Wang and Yin Yang, "Descent Methods for Elastic Body Simulation on the GPU", in ACM Transactions on Graphics 34-8, (SIGGRAPH Asia 2016). Mingliang Xu, Mingyuan Li, Weiwei Xu, Zhigang Deng, Yin Yang and Kun Zhou, "Interactive Mechanism Modeling from Multi-view Images", in ACM Transactions on Graphics 34-8, (SIGGRAPH Asia 2016). Zhao Haiming, Weiwei Xu, Kun Zhou, Yin Yang, Xiaogang Jin and Hongzhi Wu "Stress‐Constrained Thickness Optimization for Shell Object Fabrication", In Computer Graphics Forum, vol. 36, no. 6, pp. 368-380. 2017. Yuliang Rong, Tianjia Shao, Youyi Zheng, Yin Yang and Kun Zhou, "An Interactive Approach for Functional Prototype Recovery from a Single RGBD Image", in Computational Visual Media 2-8, pp 87-96, 2016 (CVM annual best paper of 2016). Yin Yang, Dingzeyu Li, Weiwei Xu, Yuan Tian and Changxi Zheng, "Expediting Precomputation for Reduced Deformable Simulation", in ACM Transactions on Graphics 34-6 (SIGGRAPH Asia 2015). Yuan Tian, Yin Yang, Xiaohu Guo, Balakrishnan Prabhakaran, "Adaptive Hierarchical Shape Matching", in proceeding of PG 2015 (short paper). "Stable Haptic Interaction Based on Adaptive Hierarchical Shape Matching" in Computational Visual Media 1-3, pp 243-265, 2015. Steven Garcia, Patrick Kelley, Yin Yang, "Fast Image Segmentation on Mobile Phone Using Multi-level Graph Cut", in Proceeding of GI, pp 81-88, 2015. Yue Xie, Weiwei Xu, Yin Yang, Xiaohu Guo, Kun Zhou, "Agile Structure Analysis for Fabrication-Aware Shape Editing", in Computer Aided Geometric Design (GMP 15), Vol. 35-36, pp. 163-179, 2015. Ran Luo, Lifeng Zhu, Weiwei Xu, Patrick Kelley, Vanessa Svihla, Yin Yang, "Interactive Design and Simulation of Tubular Supporting Structure", in Graphical Models, Vol 80, pp16-30, 2015. Ziying Tang, Yin Yang, Xiaohu Guo, Balakrishnan Prabhakaran, "Distributed Haptic Interactions with Physically-Based 3D Deformable Models over Lossy Networks", in IEEE Transactions on Haptics, Vol. 6, No. 4, pp. 417-428, 2013. Yin Yang, Weiwei Xu, Xiaohu Guo, Kun Zhou, Baining Guo, "Boundary-Aware Multi-Domain Subspace Deformation," in IEEE Transactions on Visualization and Computer Graphics, Vol. 19, No. 10, pp. 1633-1645, 2013. Yin Yang, Xiaohu Guo, Jennell Vick, Luis Torres, Thomas Campbell, "Physics-Based Deformable Tongue Visualization," in IEEE Transactions on Visualization and Computer Graphics, Vol. 19, No. 5, pp. 811-823, 2013. Yin Yang, Zichun Zhong, Xiaohu Guo, Jing Wang, John Anderson, Timothy Solberg, Weihua Mao, "A Novel Markerless Technique to Evaluate Daily Lung Tumor Motion Based on Conventional Cone-Beam CT Projection Data," in International Journal of Radiation Oncology Biology Physics, Vol. 82, No. 5, pp. e749-e756, 2012.